Offices Up North Ltd was established in 2009 by John Nash who has over 5 years experience letting serviced offices in Manchester. We offer a free and impartial service helping businesses find serviced office accommodation in the North. Offices Up North is the only serviced office operator dedicated to finding businesses serviced offices in the North. Director John Nash is the key member of staff. A graduate from Lancaster University, John has worked for both Abbey Business Centres and The Works Business Centres in Manchester and is well known in the serviced office industry. We currently have over 30 separate office buildings on our books, but the number of actually serviced offices available is upwards of 200. We are constantly expanding and add approximately 5 - 10 new properties each week. 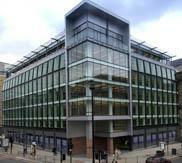 We are completely free to use for those finding serviced offices. We charge a commission of 10 per cent to operators on successful placements.